Looking for a way to up your self-care routine? Mindful Mist is a face/body/room spray made from spring water and organic and/or wild-harvested essential oils. It is intended to be used to spray the face (close your eyes first! ), body, pillow, room or yoga mat. It is an excellent meditation aid, wonderful for anxiety, and safe to spray on your pillow before sleep. It's also a terrific way to help kids calm down at the end of the day! Nothing artificial, vegan, non-GMO, no corn, soy or wheat. 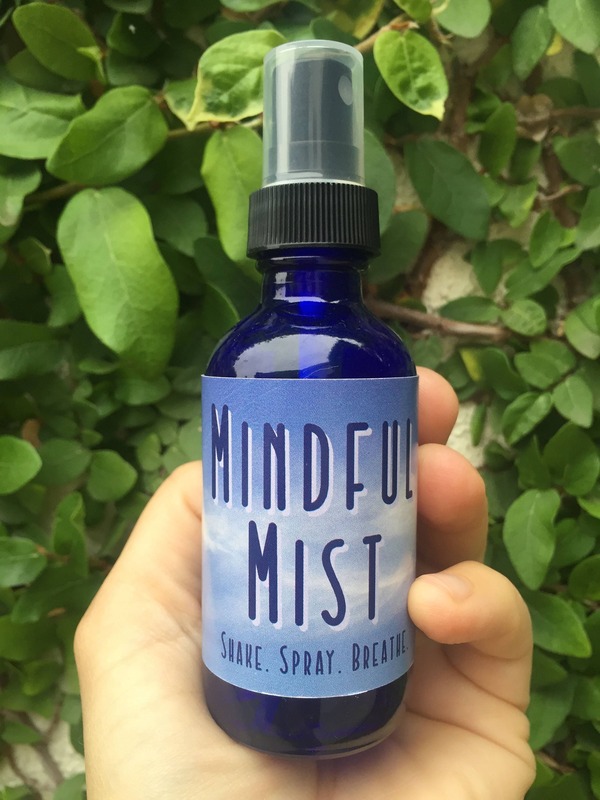 Mindful Mist comes in a 2 ounce blue glass bottle with a plastic spray nozzle and lid, and is packed safely in bubble-wrap. Spring Water, Lavender (Organic, India), Rose Geranium (Organic, South Africa), Mandarin (Organic, South Africa), Ylang Ylang (Organic, Madagascar), Lemongrass (Wild Harvested, South Africa). I created this face/body/room spray to treat my own anxiety. (It was one of many measures, including acupuncture, herbal medicine, hypnotherapy and meditation) that helped me heal from postpartum anxiety and panic attacks. I'm a Licensed Acupuncturist, and I started using it with all of my patients - not only those with anxiety- by spraying it over their face and body after I had inserted the needles. The response was overwhelming. "I want some of this!" They said. I also started using it with women in labor, and with my kids, when they were resisting bedtime. I adjusted the blend of essential oils based on feedback from friends, family and patients, and started selling 2 oz. glass bottles, labeled with a Brother P-Touch machine "Mindful Mist," in my acupuncture clinic. I couldn't keep it in stock! Many people started buying them as gifts - for baby showers, Mother's Day/Father's Day, birthdays - and now, several years later, I'm making it available to people all over the world. Not for internal use. Do not use on broken or abraded skin, do not spray in eyes. Do not use on children under the age of 6. Do not use during pregnancy without first checking with your care provider. Glass bottle(s) will be wrapped in bubble wrap for safe shipping, then wrapped in brightly colored tissue paper and tied with ribbon. I couldn't have asked for a better gift for a grieving friend in need of dreamless sleep. I tried Mindful Mist for myself about a year ago and LOVED it, and knew it would also be the perfect gift for my dear friend after her miscarriage. The scent is tantalising without being at all overpowering (I am very sensitive to fragrances) and it is such a perfect self-care gift to spray the mist on your pillow or in your room before going to sleep each night. Wish I could give it 10 stars! Can I eat/drink this product? NO! Mindful Mist is only for external use: spray on face, body, pillow, room. Do not eat or drink.